What is the DAS solution? The DAS Cloud Platform is a product line designed specifically for Property Managers and organizations that require remote access management. The system allows staff to remotely monitor and unlock doors across multiple locations from any internet connected device, anywhere, anytime. Traditional access control systems are designed with user presence and fixed staff in mind. They typically operate by providing these set users with access cards or key codes that can be used to unlock specific doors and gain entry to various parts of a single building. The DAS solution takes a completely different approach. 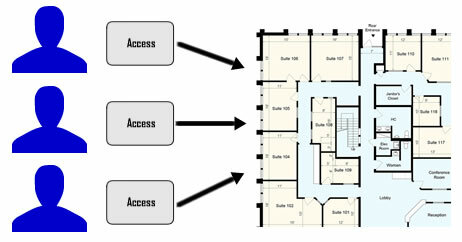 Instead of being tied to physical cards the system is managed and operated by individual users who, through their web-enabled devices (Smartphones, PCs, tablets etc), have the ability to unlock or monitor various points of entry on multiple buildings, potentially across any magnitude of geographic distances. The driving goal behind the DAS solution is that access is controlled manually by a select group of offsite operators (building managers, maintenance supervisors, etc) instead of the individuals who are physically present. Why operators instead of users? 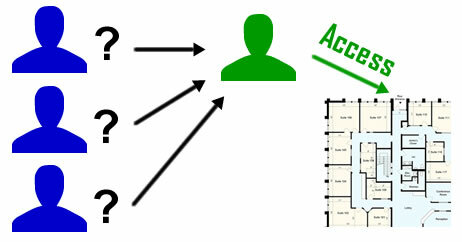 For a standard office environment a user-oriented access control system makes sense. The same set of employees will need to have the same access to the various parts of the building on a daily or recurring basis. An office is just one of the many places where controlled access and entry restriction are needed though, and it is in these diverse environments that the DAS solution sets itself apart. Electrical rooms, Telecom closets, and building maintenance points are just some examples of more general facility areas where access may need to be provided to a rolling group of people such as outside contractors and service workers. Unlike regular employees these types of people may only require single use or infrequent access and so presenting them with physical controls (keys, cards, codes of some type) the way you would a standard employee can be costly, time consuming, and potential dangerous. Signing out keys provide no protection from duplication or unauthorized misuse, and sending staff to physically open and close doors and chaparone is often a waste of valueable skilled working time. DAS eliminates all of these problems by allowing control to remain in the hands of supervisors and trusted staff without requiring them to spend their days traveling to and from sites. With a DAS solution in place all an outside worker or contractor needs to do is contact the specified operator. That person can then, with the simple tap of a button, choose to release the door and grant temporary access immediately, in real-time. The door automatically locks when it's closed again and, thanks to built-in monitoring feature, the operator can check back in at any point to make sure everything is secure after the work on site is complete.